SendSafely Enterprise customers can now require external users to accept customized terms of access prior to allowing external users to send or recieve items using their SendSafely Enterprise portal. This feature was designed for organizations that distribute sensitive information through their SendSafely portal and want to impose specific restrictions on how the information is used. 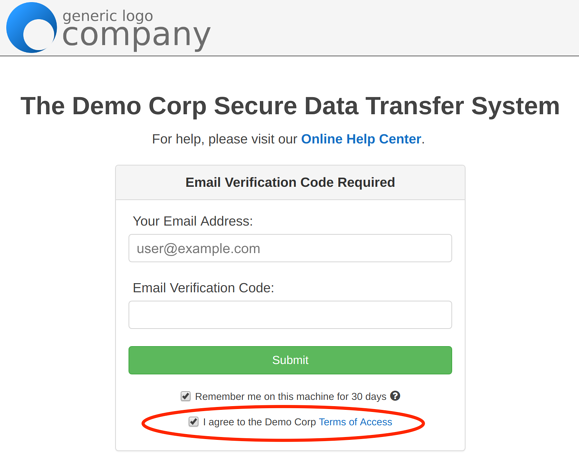 Once configured, a Terms of Access checkbox is displayed on the external user login page, and users must check the box in order to complete the login process. The Terms of Access link points to a custom URL managed by your organization, so all maintenance and updates to legal verbiage are handled independently of SendSafely. For more information or questions regarding how to enable SendSafely's Custom Terms Clickwrap, you can email our support team at support@sendsafely.com.